I reported in my August Outlook Report that considering the numerous macro and micro economy related corrective actions that the government and the IMF had been working on, coupled with e fact the IMF package was also front-loaded, meaning that all the tough choices and actions were implemented earlier on in the program, all things being equal, the Ghanaian economy should begin to start showing some glimmers of positive results. One such indicator that I referenced was Ghana’s double-digit inflation figures. Well, I am here to report that after two years of persistent upward inflationary movements, the economies Producer Price Index (PPI), which measures the average change over time in the prices received by domestic producers for the production of their goods and services improved in the month of July. The PPI for Ghana reports the price indices with reference to September 2006, the base period. Ghana is still far off from its former single digit inflationary figures that it last enjoys in November 2012. But it is nonetheless a clear and strong indication of what the future holds. Rate of decline: The Ghana annual Producer Price Inflation fell sharply to 10.6 percent in July from 23.1 percent the previous month, the national statistics office said on Wednesday, representing a decline of 12.5 percentage point relative to the rate recorded in June 2015. 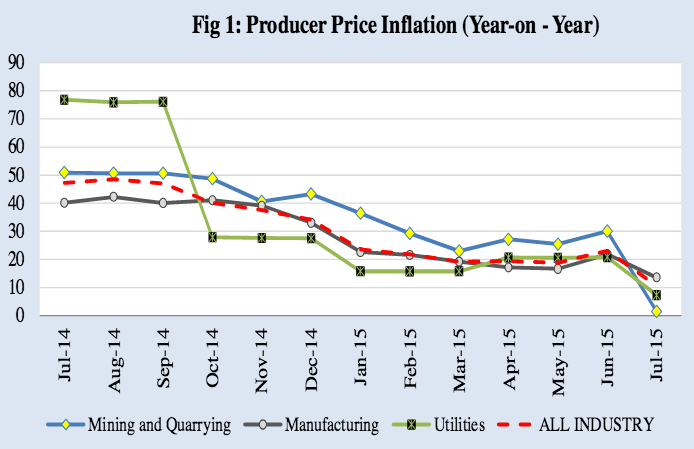 Highest year-on-year increase: The manufacturing sub-sector recorded the highest year-on-year producer price inflation rate of 13.5 per cent, followed by the utilities sub-sector with 7.3 per cent. Lowest year-on-year inflation rate: The mining and the quarrying sub-sector recorded the lowest year-on-year inflation rate of 1.5 per cent. 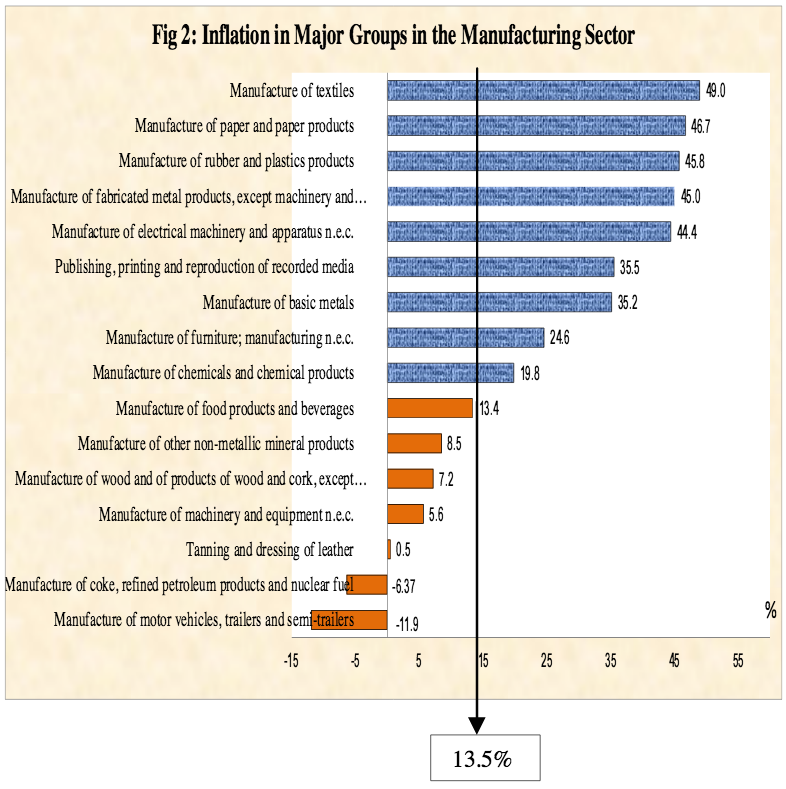 Highest inflation rate: The monthly changes in the producer price index indicated that manufacturing recorded the highest inflation rate of 3.1 per cent, followed by the utilities sub-sector with 0.1 per cent. Lowest producer inflation rate: The mining and the quarrying sub-sector recorded the lowest producer inflation rate of -18.3 percent. Declining Inflation helps the Cedi: Inflation is associated with currency depreciation/appreciation as well. Suppose the price level increases by 40% in the Ghana, while the price levels of its trading partners remain relatively stable. Ghanaian goods will seem very expensive to foreigners, while Ghanaian citizens will increase their purchase of relatively cheap foreign goods (and vice-versa). The Ghanaian Cedi will depreciate as a result. Hence improving inflation rates will all things being equal, help slow down, and ultimately mitigate against the depreciation of the Cedi. Improved real income: Inflation affects different people in different ways and to different extents. But what it means for everyone is that real incomes fall when prices rise. This is so for the country as well as for individuals. Inflation reduces the consumers ‘purchasing power’, meaning that people need more money to buy the same basket of goods and services they had purchased prior to the rise in prices. So when the Bank of Ghana reports that inflation was for example 10%, it is actually saying that incomes have fallen by 10% in real terms. Hence as inflation improves or declines, real incomes and purchasing power of consumers also improves. Sector visibility and insight: PPI provides good breakdowns for investors in the companies surveyed in the mining, commodity info, some services sectors. Impact on financial markets: Improving inflation can result in positive market movements since it is usually interpreted to mean that, consumers should begin to start spending more on goods and services in the economy thereby improving corporate revenues in the long run. Important indicator: Inflation is probably the second-most watched indicator after unemployment data, as it helps investors deduce the future direction of monetary policy. Helps Predict CPI: The core PPI can serve multiple roles in improving investment-making decisions because it can serve as a leading indicator for CPI. Most cost increases or decreases that are experienced by producers and retailers will be passed on to customers, which the CPI could later validate. Investors look at PPI to get a sneak preview of CPI and overall future inflation rates going forward. So in conclusion, declining PPI is a very positive economic indication of things to come. Hopefully it will help in increasing the pace of the countries economic recovery.